Airmen have been told not to leave an RAF base in uniform to avoid being verbally abused by civilians. Officers at RAF Wittering reported that servicemen have been taunted by people in nearby Peterborough who oppose UK involvement in Afghanistan and Iraq. Although military staff are encouraged to wear uniform in public, a local decision was made against doing so in the city, the Ministry of Defence said. The government is investigating as "a matter of urgency". Cambridgeshire police said they did not know of any abuse reported in the city. But a spokesman for RAF Wittering said staff from the base had reported incidents of abuse "up the military chain of command". He said acting on advice from RAF police, the station commander had then taken the decision that staff should not wear uniforms off site. The Mayor of Peterborough, Marion Todd, said the decision not to wear service uniforms was a "sad day for the city". John Peach, leader of the Peterborough City Council, said: "I guess to a degree they are perhaps a sitting target but it's terrible that people have to take theses sort of measures because we're on friendly terms with RAF Wittering. "In fact we gave them the Freedom of the City award some time ago and we welcome the base being there and are on good co-operative terms with them." Peterborough's Conservative MP Stewart Jackson said he thought the RAF may have overreacted. "I think it could have been the case that there was some abuse of military personel by a very very small number of people," he said. Defence minister Derek Twigg told Five Live said he believed it was "a tiny minority of people" responsible for such abuse, adding that it was a "great shame on the day we've got 184 members of the armed forces being honoured for their courage and bravery". A government review of the public's perception of the military is being carried out. It has been suggested as part of the review that soldiers may be encouraged to wear their uniforms off-duty to boost their popularity. 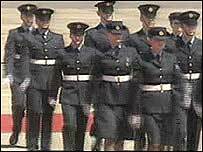 Defence Secretary Des Browne said: "We must defend our forces' right to wear their uniforms in public. "It is a great shame that some individuals in this community don't respect our forces, who are daily doing a great deal for this nation. "This is not a situation we should tolerate. We learned about this today and are investigating it as a matter of urgency. 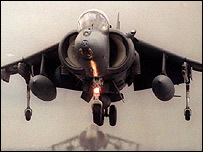 RAF Wittering was established in 1916 and more than 2,000 servicemen and women are based at the station, which is best-known for housing a fleet of Harrier jump jets. Air Chief Marshall Sir Glenn Torpy, said: "Whatever people's views are about specific military operations, everyone should be able to recognise the bravery and professionalism of our Armed Forces and respect the difficult job they do." Former Air Vice Marshall and a former station commander at Wittering, Gerry Connelly, said he would be concerned about politicians "trying to overturn the decision of the local commander because at the end of the day they are the people on the ground". Shadow Defence Secretary Liam Fox said: "I think that the majority of our public would be appalled to hear that there are no-go areas for our Armed Forces, even in their own country." This is appalling. RAF employees should not be asked to refrain from wearing their uniform if they wish to do so. It should be a matter of pride to wear such a prestigious uniform. Every single person in the UK owes the RAF a huge amount of gratitude for the job they do. I would not hesitate to thank anyone wearing a forces uniform; we owe our freedom to them. When I was at university, and a member of the British Army's UOTC at that university, we were all advised to not wear uniforms in public unless completely unavoidable. This kind of discretion has been a long standing part of the Army's way of ensuring the safety of both its members and the public. The same advice was widely accepted as common sense when I later attended other Army establishments. The policy of discretion allows the military to carry out its duties more efficiently and with minimum disruption to civilian life. After all, the military's purpose is to serve civil society, it is not civil society's purpose to idolise the military. People do often give you second looks when in uniform but the majority of the time, it is for the best - very few make negative comments about the work of the armed forces. It is a shame those in some cities do not respect the work we do. I'm a Brit living in the United States and I'm very much aware of American opposition to the war in Iraq. However, American service men and women are not being abused but are given respect by the American population. British servicemen and women should be given the same respect for the job they are doing. Those who want to protest the war can do so - but not at the expense of those who put their lives on the line to defend the right to protest. I used to be in the University air squadron at Birmingham. I used to have to travel in uniform sometimes but generally tried to avoid it because it makes people uncomfortable. It's not like a police uniform where someone wears it to make it clear they are there to help. It's just a reminder of an authority and power we chose to overlook in this country and seeing a uniform in public reminds many of political instability around the world or in Europe's own history. For this reason there is a healthy mistrust of authority in this country and wearing a uniform can seem inflammatory and needless unless on duty as opposed to Japan for example, where uniform is very important and respected by many. In this country Policemen don't go to the pub in uniform, why should off duty officers and airmen etc wear the uniform. It seems a confused affair. In my experience life was simpler keeping it in my bag until on base.